The king of crypto still has it. Bitcoin is a controversial topic for investors. There are experts on both sides arguing for and against the once hot cryptocurrency. While the current arguments center around the recent price plunge and the lack of federal regulation, there's one argument that a lot of experts can agree on--bitcoin is here to stay. "[There's] Less than a 1% chance in my mind that bitcoin won't succeed," said Hermann Finnbjörnsson, founder and CEO of Svandis. "I think that there are a lot of reasons to be bullish on bitcoin. Banks are getting into bitcoin." But, let's face it, anyone can say that bitcoin is the future, so why should investors take it seriously? After the collapse in prices during the winter of 2018, where bitcoin fell from $19,000 to $7,000 seemingly overnight, investors would be right to feel bearish about the cryptocurrency. Those naïve bears could be missing an opportunity. Experts TheStreet spoke to almost all agreed that investors should still feel bullish on the future of bitcoin despite the price wipeout. The bears point to the daily volatility around bitcoin and often colorful folks involved in the space. But the risk reward appears skewed to the bullish camp. "There are numerous reasons why this new asset class has captured people's imagination since its inception in 2009 -- bitcoin displays a number of characteristics that make it a very powerful and alluring concept. It allows for direct, peer-to-peer transfer of value in completely trustless transactions," said Russell Korus, CEO of EZ Exchange. Added Korus, "It is fully decentralized, autonomous, writes all of its records to a public ledger, and its record-keeping is completely immutable. These characteristics contribute to creating a brand new paradigm which represents a shift from the free exchange of information to the free exchange of value. This has far-reaching and society-shifting repercussions, and creates the conditions for mass disruption of intermediaries in virtually every industry." That potential looks to have gone lost amid the recent focus on price volatility. Some, like Finnbjörnsson who have been involved with bitcoin since its early days, thinks that the value can only go higher after the dip. "I believe that it'll hit $10,000 by the first week of November." He attributes the possible rise to the fact that the New York Stock Exchange's parent company, Intercontinental Exchange, plans to roll out a bitcoin ETF on Nov. 5, 2018. The ETF will be launched under Bakkt, which explains its purpose "as a scalable on-ramp for institutional, merchant, and consumer participation in digital assets by promoting greater efficiency, security, and utility." High-profile companies such as Microsoft (MSFT - Get Report) , Starbucks (SBUX - Get Report) , and Boston Consulting Group have signed onto the initiative. While the ETF will open new doors for investing in bitcoin, it's just one of many reasons that investors should feel bullish. "Technology will adapt cryptocurrency to be something that you can go and buy on your phone," said Michael Terpin, partner at Alphabit fund. He theorizes that "most people are going to use their phones to play candy crush blockchain." 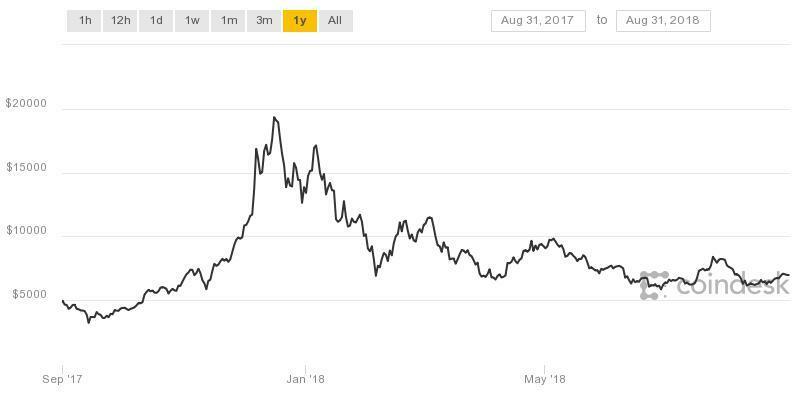 So, while the $7,000 pricetag may not look great to investors who were cheering bitcoin on last year, the future is really where they should be looking. As the crypto moves into the next stage of its life, it'll likely be a better asset for portfolios as more people understand its usefulness in society. With that understanding, should come less price volatility. "Cryptocurrencies, and the distributed ledger technology that they are built on, will do nothing less than change the world in the most fundamental ways. They will have more impact on society over the next 20 years than the Internet has had over the last 20. The future of cryptocurrency is very bright," said Korus. Or so bulls like Korus hope.